On the rare occasion I can’t sleep (which is usually when I’m sick) I have an extreme exercise I execute. I get out from under the covers and lay with my head at the foot of the bed, leaving the pillow where it’s supposed to be. (Yes, I put my feet on my pillow.) The discomfort of being pillowless and uncovered creates thoughts of how nice it would be to get back under the warm covers with my head on my luscious down-filled pillow. Before I know it, I am totally consumed with the thought of turning around. It works every time for me. Once I get back under the covers I’m so grateful for it that I’m asleep before I know it. Each of my three children had their own personal way to comfort themselves to sleep. 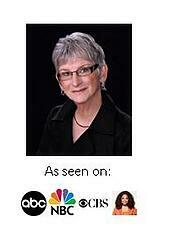 Peggy Ann had to have one of her hands above her head (sort of the way Mighty Mouse flew around). (Peggy was born “sunny-side-up or “face first” and her little fist was ahead of her face.) Michael had a teddy bear (about the size of a sparrow) that had to be tucked under his chin after he’d chewed on the arm for about a minute. Joanna loved my hair and as long as it was there when it was bedtime or naptime she’d conk. I’ve come to understand we, as teachers, must encourage our students to find their own way to success. to recognize what is supposed to be happening right now. In the SHE book my sister and I told our readers: “Customize this system to your own personal story.” We also said, “Before you organized anything, know that you are just fine in spite of the mess you’re in.” When you start from a place of acceptance, you will have positioned yourself for success. Accept what is right now, where you live, who you live with, how old you are, what you weigh and how you feel. You are exactly where you’re supposed to be. Impatience is nothing more than failing to recognize what is supposed to be happening right now. Once you accept your circumstances as being alright, that doesn’t mean it’s wrong to want to change them. One of the joys in life is knowing you can change for the better. The urge to change something for the better is why you subscribe to my emails and read my books. Be grateful you have the ability to change. Be grateful for your circumstances and know that as you change them you’ll learn more about YOU. You’ll grow in self-respect and love for the awesome woman you are. Just like my gratitude for the comfort of being back under the covers, once you’re organized, you’ll look back on the way you were and it’ll make being organized so much sweeter. Sweet dreams! P.S. All of us deserve Peace and Joy in life. 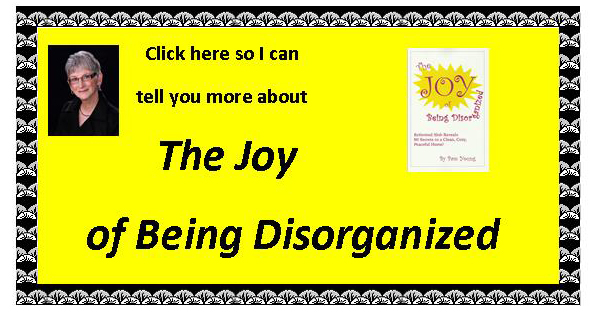 The JOY of Being Disorganized, is chock full of ways to achieve both NO MATTER HOW BIG A MESS YOU ARE IN.